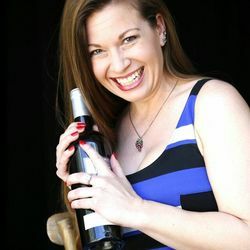 To friends and colleagues, Kristin is the go-to “Wine Girl.” A South Bay, Los Angeles local, Kristin loves to travel for beaches, food and the wines that pair with each. She recently completed the WSET Level II series in an effort to fortify her wine calling and to enter the beverage industry professionally. When Kristin is not decanting something delicious, you can find her on the softball field, watching UCLA sports, painting or singing karaoke. But regardless the activity, wine will most likely be involved! Delectable: What sparked your passion for wine? Kristin: In 2007, I went on a date with a guy who knew how to order wine off the thick book in a restaurant. He swirled, breathed and visually evaluated the wine before even sipping. I had no idea what he was doing or why he was doing it, and I sort of thought he was being snooty and a bit silly. He totally schooled me. I love having the edge, and I hated feeling clueless on all accounts with respect to wine that night. I started researching and within a few months, I booked my first wine touring adventure, drove up to Sonoma, and have never looked back. D: What wine region are you wild about right now? K: I love Lodi, California. The climate provides for big, bold and complex zinfandels. At the current price-point, I buy as many now before they become the next trendy expensive varietal. D: What is the most unusual wine you’ve ever tried? K: A friend once brought me a bottle of Summer Vine Habanero Passionfruit Wine from San Pasqual Winery as gift. Not generally a fan of wines in the “other fruit” category, I found it more pleasing than most non-grape wines. The habanero heat complimented the sweetness of the lilikoi, bringing both complexity and balance. You can check out my full rating on Delectable, of course! D: What are some tips for aspiring connoisseurs? K: Every wine is different, and changes over time. Your palate changes, too! Revisit both wines you have loved, and wines that you may grow to love later. Make sure you experiment. Try pairing with different food flavors and textures. Every meal is an opportunity for your palate to fall in love with a wine pairing. D: What is your golden rule for wine? K: Never refuse a wine based on what you think may or may not be in the bottle! Taste, taste, taste… And take notes, so you remember your precise thoughts and experiences. Keep good records so you know when to open a bottle, what food pairings to make, whether to decant, and all those delicious details for when you revisit futures. D: If you were a wine, what wine would you be? K: I would be a South African Pinotage. Largely unknown and unrecognizable to the general public, distinctively attractive to a discerning audience. From fashion to friends, I’ve always followed my own calling with a hint of mystery. It only makes sense that I would go incognito as a silky smooth metallic, yet voluptuous red of intrigue. If you want a good Pinotage, check out my Delectable review of the 2014 Backsberg Pinotage.